If you are a new and expecting parent, how do you give your baby the best chance for a healthy and happy beginning? With all the synthetic fabrics and chemicals your baby can come into contact in their first years, from diapers to creams, are you making sure you don’t overlook the safety of your baby’s mattress? Considering your little one spends a large amount of time sleeping, a safe and healthy mattress that is supportive to their small body while being durable and easy to clean should be a prime concern for any parent. And the choices out there are plentiful and can be overwhelming. Between the different types of material inside the mattress to the broad price range of baby mattresses, it can be a chore to find the one that suits your needs, let alone meets safety standards. Not to mention, the industry is one that is ever evolving, with new and innovative products and materials coming out every year. In this article, we seek to dispel some of the confusion surrounding the baby mattress market and bring to you our recommendations for the best baby mattresses on the market, today. The My First Premium Memory Foam Mattress gets our vote for best baby crib mattress because of its safety features and high quality materials and for keeping its price well below similarly built mattresses. It has rave reviews and although it is memory foam, your baby doesn’t sink in too much, proposing a breathing hazard. Non-toxic, comfortable and affordable, this mattress is a winner in our books. You want a bed that meets safety standards: This bed meets all the requirements for safety in terms of crib mattress sizing, anti-flammability and non-toxic materials. You want a bed that’s easy to clean: The My First Premium Memory Foam Mattress offers the great option of a waterproof bed that also has a removable, washable cover, making clean up much easier than with some of the competing mattresses. You are looking for a firm and safe mattress: As a mattress that offers the comfort of memory foam, you may be worried about the level of firmness or safety with this mattress. However, the high-density construction of this foam means that your baby still lays on top of this bed, rather than sinking in. Your baby is a light sleeper: Customers are appreciating how quiet this mattress is compared to vinyl covered, “crunchy” sounding mattresses. If your baby is a light sleeper, this bed might be the choice for you. 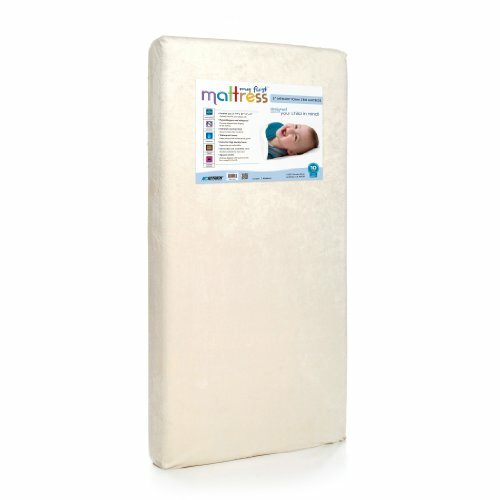 One of the top sellers for baby crib mattresses, the My First Premium Memory Foam Crib Mattress is one of the few options to be made with memory foam. 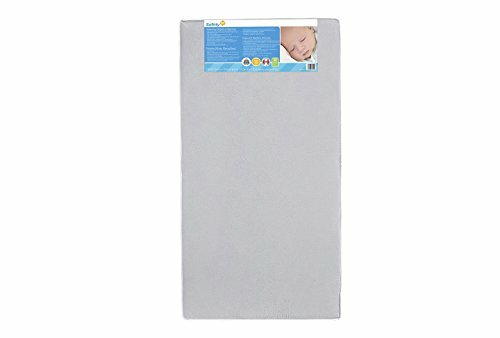 However, despite the “sinking-in” reputation foam, this one is high density and according to reviews, babies don’t sink too much under their weight. In fact, the mattress retains its shape over time without dents or sagging. This is due to the four and a half inches of high density base foam under the half inch gel memory foam layer. We like this mattress because it meets many of the safety standards that are important to ensure your little one is out of danger while sleeping. It is made with CertiPUR-US certified polyurethane foam, which means the foam is made without ozone depleters, mercury, lead, formaldehyde or phthalates. And it is also low emission, which is good to know because some customers have reported a slight odor when opening the compressed mattress. This certification shows that despite any potential odor, the foam aroma is non-toxic and should dissipate after a few days and some customers have reported that they have had no smell at all. At over 51 inches by 27 ¼, it meets CPSC standard for safe crib sizing so if you have a standard sized crib, it should fit fine and it is five inches thick so it meets requirements here as well. We also like that it meets or exceeds other safety standards, for flammability and is considered hypoallergenic and antimicrobial. At just under 12 pounds, this mattress is heavier than some of the beds that don’t contain memory foam but not so heavy that taking it out of the crib should be a challenge. Best of all, it has a removable and washable cover so it is easy to clean. The cover is also waterproof so it resists stains and odors that can sink into the mattress. Customers are lauding the support and firmness of this mattress and they seem to love that it has a totally silent surface, unlike other vinyl covered mattresses that can crinkle and wake up your baby. Customers also loved that the cover is easy to remove and toss in the washing machine and that it dries quickly, both during surface cleaning and when tossing in the washer and drier. The Safety 1st Heavenly Dreams Crib Mattress is the number one best-selling crib mattress and it’s easy to see why. It ticks almost all of the boxes on our list of requirements for what to look for in a baby mattress and at a price that doesn’t break the bank. We like this mattress for it’s simple, easy to clean design. It promises a long list of features and the customer reviews show that they can deliver on all of them, with few complaints. You want an easy to clean cover: Some people prefer the easy to clean surface of a vinyl mattress cover. In that case, this bed is a great option. Completely waterproof, while this mattress doesn’t have a removable cover, it is surface washable and messes won’t sink into the mattress. You want a lightweight bed: At just over seven pounds, this mattress is one of the lightest baby crib mattresses on the market. If heavy lifting is difficult for you, or you want a mattress that is easy to get in and out of the crib, this could be the one for you. You want an extra firm bed: The high density thermo-bonded fiber core means this bed is on the extra firm end of the spectrum so if you are looking for one of the firmer beds on the market, this is a great choice. You are on a budget: This is one of the most affordable baby crib mattresses on the market and considering it converts to a toddler bed, it offers great value and years of use. The number one best seller in crib mattresses, this mattress meets nearly all of our requirements for what makes the top of our list, with a few exceptions. We love that this mattress is just a no nonsense, straight forward, mattress. It is lightweight compared to a memory foam mattress and the vinyl covering means it is easy to clean. There is no cover to remove and wash, you can just surface wash the waterproof mattress surface. This mattress is on the firm end of the baby mattress spectrum. It is made with a high density thermo-bonded fiber core so there is no “sinking-in” feel–your baby rests on the surface of this bed. This bed is hypoallergenic and is made with non-toxic materials. It is free of phthalates and lead and has Greenguard Gold Certification. This means it is low emission and it meets federal flammability standards, while not using harmful non-flammable sprays or treatments. At 52 ½ by 27 ½, this mattress is the right size to fit all standard cribs safely and meets CPSC standards for sizing. It is also the right thickness for safety and comfort. Above all, the vast majority of customers are reporting that this mattress fits perfectly in their crib, but make sure you measure your crib before purchasing to make sure it meets CPSC standards for sizing. Not made of all natural materials, this mattress isn’t as breathable as some with a natural or organic cloth cover. Because of the vinyl cover, it doesn’t wick away moisture as some mattresses can and some customers have reported that their baby sleeps a bit hot with this bed. As well, there have been some reports that the vinyl cover of the bed has cracked and peeled for some customers over time, although overwhelmingly most customers are getting years of use out of this bed. Most people report that they love how resilient and durable this bed is. It doesn’t sag over time and it stands up to years of use as their baby grows into toddlerhood. It lasts through crib conversion to toddler bed and for the amount of years customers are getting out of this bed, the price can’t be argued with. The Sealy Soybean Foam-Core Crib Mattress brings the best of what has made Sealy such a well-known name brand over the years for adult beds, to their smaller, crib sized mattress. Described as extra firm, this mattress still manages to be lightweight, at just over eight pounds. You want a lightweight bed: For a mattress with multi-layered construction, this bed is surprisingly light at just over eight pounds. 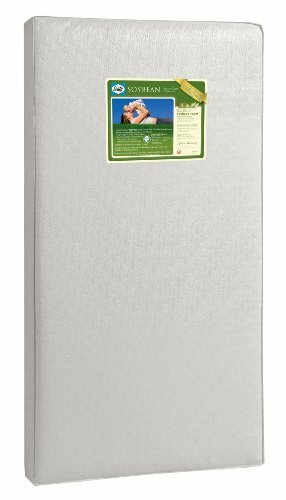 Easy to get in and out of the crib to replace sheets or clean, this is an easy to use mattress. You want a mattress with some natural materials: This baby crib mattress has some plant based, soybean oil in the construction of the foam. You want a waterproof surface: The embossed, vinyl coating of this waterproof mattress means that clean-up is a breeze and dampness won’t sink into the bed. You are on a budget: For a company with such a reputable name and for a bed with some natural, plant-based materials, this mattress is a great value. The Sealy Soybean Foam-Core mattress meets a ton of safety standards, including ASTM crib mattress standards and is Greenguard Gold Certified so it is free from toxic chemicals and emissions. The foam construction of this mattress is also CertiPUR-US certified. We like this mattress because it has durable, firm and multilayered construction, rather than some baby crib mattresses that are just a chunk of foam with a cover. The Sealy mattress boasts several layers included a soybean “enhanced” core but is really only nominally natural at just over twenty percent soybean construction. To not only promote comfort but help with airflow it also features a soft cotton wrap layer that sits under the cover. The layers are covered with a waterproof and surface wipe cover that they call “pearl embossed” which is just a textured, vinyl coating. For this reason, the mattress doesn’t promote air-flow as well as some all natural mattresses. While a few customers have had problems with mattress sag over time, the majority of customers are reporting using this mattress well into their child’s third or fourth year with no tearing or sagging. The mattress fits standard cribs well and meets sizing standards for width and length. At a great price point for a reputable brand name, this mattress is a great choice for parents who are on a budget but want to go with a reliable product and with a lifetime warranty on workmanship. Easy to clean with no fabric covering to dry out when accidents inevitably happen, this mattress is low maintenance and grows with your baby since it transfers well to toddler beds. 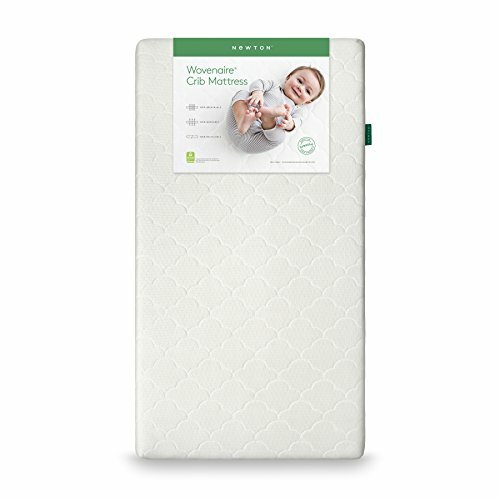 Priced higher than some of the other top mattresses we’ve reviewed here, the Newton Crib Mattress is a great option for those who don’t mind spending a bit more to get a crib mattress made from mostly natural materials. You want a mattress made with mostly natural materials: The core of this bed is made primarily of air and a plant based material. Unlike other beds that have a foam core, this bed has its own natural netting type material inside and contains no latex or glue. You want a mattress that is recyclable: Because this mattress is natural, it is fully recyclable and won’t clog up a landfill. You want a washable bed: Because of the breathable nature of the core, this bed is fully washable and dries quickly. You need a hypoallergenic bed: The all-natural construction of this bed, apart from the polyester cover means that this bed has been made with baby sensitivities and allergies in mind. No latex and no glues or chemicals-this bed is hypoallergenic. While the higher price might discourage some customers, others might appreciate that this mattress converts well to a toddler bed and should last many years. Greenguard Gold certified, this mattress has many benefits as it’s made from predominantly natural materials and is fully recyclable when you are done with it. The mattress is made from a proprietary material called “Wovenaire” which is basically an all-natural material that the company claims is made of 90 percent air and ten percent food grade polymer. Rather than a foam piece, the Wovenaire material is more of a mesh netting type of material so it’s no wonder why it is so breathable. It contains no foam or latex or glues of any kind and is hypoallergenic. However, it is good to note that the cover is made of polyester so if your baby has any polyester sensitivities, it’s a good idea to add a second cotton cover or replace the one that this mattress comes with. The mattress is properly sized at 28 by 52 inches and is five and a half inches thick. It’s also fairly lightweight at only 11 pounds and so it can be removed from the crib quite easily for sheet changing or clean ups. This mattress is rated firm but customers report that it is supportive and safe but has enough resistance that the vast majority of babies tested are comfortable. No crunchy or noisy vinyl coating here, the mattress is breathable and quiet. In fact, many customers rave about the breathability and moisture wicking quality of this bed. The quilted cover promotes air circulation and easy drying. One thing to note, though, the breathability would naturally change if you were to add a waterproof or plastic coated mattress cover instead of the polyester cover the bed comes with. The core is also washable so when a leak sinks through it can be surface washed easily without damaging the mattress materials. A great option for a mattress made with a natural food grade foam, the Newton Crib Mattress converts well to toddler beds and lasts for years with few complaints from babies or parents. 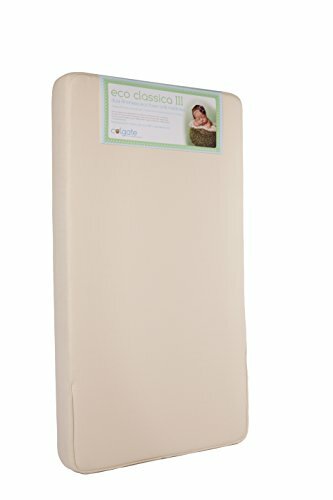 If you are looking for the benefits of a mattress with plant based or natural materials but with the comfort for your baby of memory foam, then the Colgate Eco Classica III Mattress might fit your needs and your budget. Priced lower than other mattresses with natural components, the Colgate mattress meets many safety features and is a great value. You want a mattress that converts well to a toddler bed: We love that this mattress has two usable sides-an extra firm side for infants and a less firm side for when you move the mattress to a toddler bed. You want a bed that meets safety regulations: This bed is Greenguard Gold certified and made with Certi-PUR-US certified foam so you can feel safe knowing that the foam construction does not negatively affect your baby’s air quality. You need a firm mattress: A firm mattress, the density of this bed ensures that your baby will float on top, safely, rather than sink in. You need a lightweight bed: At just under thirteen pounds, this is a fairly lightweight bed considering that it has two solid layers of high density foam and a triple layer cover. We love this mattress for its durable construction and the fact that it has two usable sides with two levels of firmness so you can use the extra firm side for your newborn or infant and the firm side once your baby graduates to a toddler bed. A six-inch mattress that meets sizing standards, it is Greenguard Gold certified and made with Certi-PUR-US certified foam. The multi-layered construction seems to be of high quality and contains a flammability barrier as well as side vents to promote breathability. The top cover is waterproof and surface washable as well as tear resistant. Parents are reporting their babies sleep safe and sound on the firm but comfortable surface, and that the mattress fits snugly in their standard sized cribs. At just over nine pounds, the mattress is still easy enough to get in and out of the crib but has a good level of density for a foam mattress. In terms of natural materials, the foam contains some plant based oil to replace some of the petroleum based material. But while the product description mentions the cover is made with certified organic cotton, the company website doesn’t mention this. Some customers have reported receiving a mattress not at the quality level as the product listing suggests so it’s best to check with the company to make sure you are getting what they advertise. Customers are overall pleased with the quality of this mattress that has no off-gassing or bad smells and the price point for a bed with two usable sides means that you’ll get a few years out of it, making for great value. Based on our research, we feel that the My First Premium Memory Foam Mattress is the best baby crib mattress on the market. While the Safety 1st Heavenly Dreams Crib Mattress is the number one best-selling crib mattress, we feel the negative reviews prevented us from putting it in our number one spot. Conversely, the My First Premium bed has a ton of great reviews and very few dissatisfied customers. We love that it offers your baby the comfort of memory foam, while still being firm and safe, and the fact that it has a silent cover, while still being waterproof is a huge selling point in our books. Finally, it offers a wide range of features at a great price while meeting all the necessary safety regulations that ensure your baby is getting his or her best start. Apart from correct sizing, look for certifications from reputable organizations that guarantee the mattress is non-toxic and non-flammable. There are a number of such organizations to keep an eye out for, including CertiPUR-US who certify that foam is non-toxic and certification by the Greenguard Environmental Institute who certify that a product is emission free and does not impair indoor air quality. Weight: Since a baby mattress has to often come out of the crib for cleaning, or changing sheets, look for a lightweight mattress to make your life easier. Innerspring mattresses will typically be the heaviest and foam will be much lighter, although memory foam mattresses can also be quite heavy, depending on their density. Washability: A washable mattress is an absolute must. Babies have accidents and can also sleep hot. An easy to clean surface or removable cover is going to make clean up a lot easier and will extend the life of the mattress, not to mention keep it smelling fresh. A firm mattress that also dense is best so that your baby rests on top of the mattress rather than sinking in. Natural Materials: A mattress that is made with natural materials is best for your baby. Make sure that the bed is made from natural materials that will not only be non-toxic but be more breathable. Quick Drying: A bed that is made with quick drying materials is key for keeping your baby’s mattress fresh and clean. Not only will this be useful when cleaning up a diaper leak but since babies tend to sleep hot, fabric that wicks sweat will leave your baby feeling more comfortable when they are sleeping. And a comfortable baby is a sleeping baby-very important!